This is what happens when a solar eruption hurls energy our way at 11 million mph. Sunspot AR2017 erupted on March 29 with a healthy X-1 class flare – UV radiation ionized our upper atmosphere, resulting in a “ripple” in Earth’s magnetosphere. Known as a “magnetic crochet”, the disturbance occurred as AR2017 strutted her stuff – geo-magnetic hiccups usually come knocking a few days after a flare – simultaneous “events” are rare. For a short time radio signals were lost as static assaulted short wave operators. Courtesy NASA’s Solar Dynamics Observatory – a video of AR2017 in action…. AR2017 appears to have gotten it off her chest – simmering down with only a 55% chance of M and 20% chance of powerful X class activity in the next 24 hours. Dodging yet another cosmic EMP unscathed. Scientists at Berkley have just released findings of a global “near miss” on July 23, 2012. 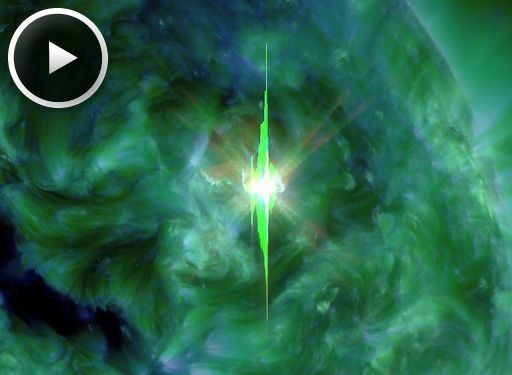 A series of immense solar flares unleashed enough energy to rival the Carrington Event of 1859. Had the storm erupted 9 days earlier, our planet would have been in the cross hairs – global power grid failures, trillions of dollars in economic repercussions with an estimate of 4 – 10 years to recover.